This product has been superseded. Click here to see the latest products. A combination of simplicity and innovation has been packed into these stunningly designed devices. 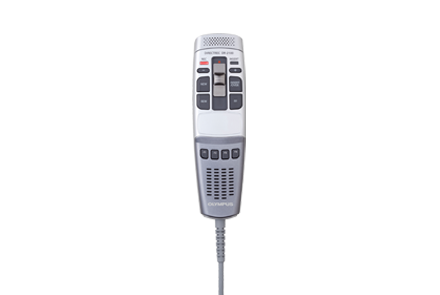 The Olympus DR-2100 is a digital dictation device which is operated using a slide switch - a familiar interface for those who are used to analogue and top of the range digital machines. Unlike conventional recorders, the Olympus DR-2100 comes with a USB connector that allows you to plug it directly into your PC's USB port and use it as a USB microphone. *Depending on how much space is available on your PC's hard disk. The Olympus DR-2100 comes with" DSS Player Pro", a powerful set of PC software tools that let you control voice recording with a click of your mouse. in a range of settings. Three programmable buttons via DSS software.